ROLL OUT THOSE LAZY, HAZY, CRAZY DAYS OF SUMMER! Roll out those lazy, hazy, crazy days of summer. Those days of soda and pretzels and beer. Anyway, Happy First Day of Summer, everyone! Yahoo! It’s finally that time of year we’ve all been waiting for, am I right?! Summer is more than just a season. It’s an institution. So many images and memories are conjured up from that one beautifully simple, wonderful word – SUMMER. It’s like FREEDOM! It’s like FUN! And, I don’t know about the soda and pretzels and beer thing, but when I was a kid it was more like iced tea, hot dogs on the grill and chocolate covered vanilla bars from the ice cream truck. I can hear that annoying sing-song “Mr. Frosty” theme as I write this. Summer was also bologna sandwiches on Wonder bread with salted fresh Jersey tomatoes and gobs of mayonnaise. Or freshly steamed crabs laid out on newspaper on the picnic table. Can you smell the Bay seasoning?! And don’t forget Charles Chips and a huge dill pickle from the barrel at the local store. And the summer CANDY!!!! Orange circus peanuts, spearmint leaves, orange slices and chewy sugared watermelon shaped jellies. HHHMMMMMMMMMMMM. How my heart is still beating my thickened blood through my clogged arteries from all this fat and sugar-laden food is beyond my understanding. Summer wasn’t only about eating, though, it was about NO MORE SCHOOL, sleeping late and swimming at the local pool, riding bikes (sometimes behind the trucks spraying mosquito repellent) and catching lightning bugs in mason jars until the wee hours of the night. It was catching sunfish on bamboo poles at Gropp’s Lake. It was fireworks on the fourth of July and a new pair of Keds sneakers. 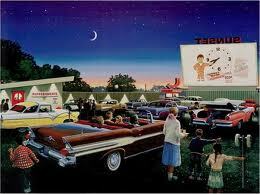 It was drive-in movies – how fun was that?! Remember listening to the soundtrack through a little metal box and burning little coils on the dashboard to repel mosquitoes? What was up on that war against mosquitoes that’s now considered lethal weapons against humans? Summer was going to the shore, collecting shells, soaking in the sun until you turned beet red and jumping the waves until you were so exhausted you could barely walk. But then later on you would muster up the strength to walk the boardwalk and eat pizza and caramel corn or a Kohr’s orange/vanilla twist. Maybe summer IS all about eating! Summer’s really a time to slow down, relax, get outside and enjoy God’s beautiful green acres. This is the time to take a break from the rat race. It’s waking slowly in the morning to songbirds twittering just outside your opened, screened window and then being lulled to sleep at night by the rhythmic chirping of the crickets. Summer is the bright sunshine and warmth upon your skin. Summer is peaceful evenings on the porch, gazing at the moon and the stars with your family and talking about a lot of nothing. It’s cherishing old friends and making new friends. It’s simply heaven on earth. So roll out those lazy, hazy crazy days of summer – you’ll wish that summer could always be here.